Only yesterday, I learnt of the death of Hester Mallin on 7th January aged ninety-one. 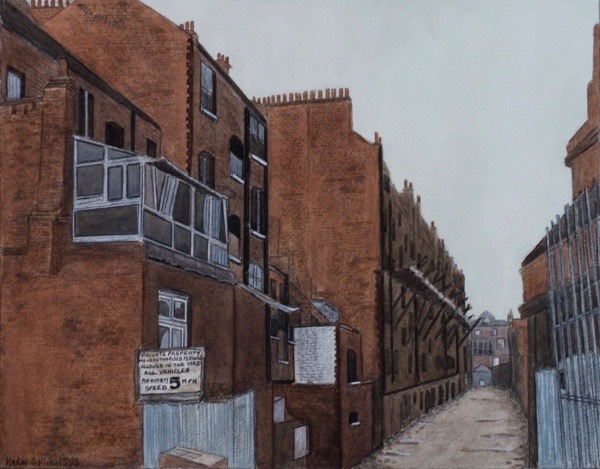 In common with my experience with that other nonagenarian artist Dorothy Rendell, whom I also met late last year and who also died in January, I feel grateful that I was able to interview Hester and record her story at the eleventh hour. 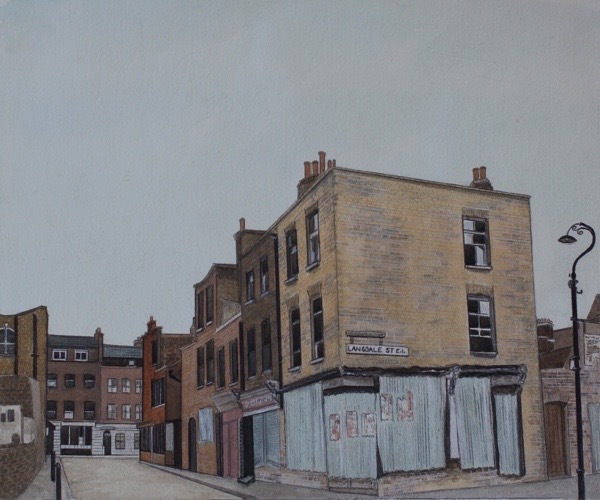 Like the princess in the tower, at ninety-one years old Hester Mallin lived confined to her flat on the top floor of a tall block off the Roman Rd in Bow, where I had the privilege of visiting and hearing her story. From this lofty height, Hester contemplated the expanse of her time in the East End. Born to parents who escaped Russia early in the last century, Hester spent the greater part of her life in Stepney, where she grew up in the close Jewish community that once inhabited the narrow streets surrounding Hessel St.
Of independent mind and down-to-earth nature, Hester took control of her destiny at thirteen and plotted her own path through life. 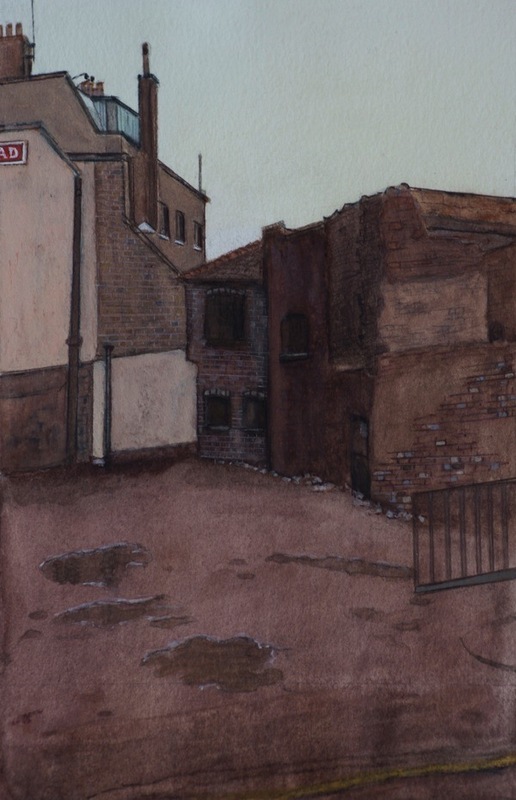 When the Stepney streets where her parents passed their years emptied as residents left to seek better housing in the suburbs and demolition followed, Hester could not bear to see this landscape – which had such intense personal meaning – being erased. So she began to photograph it. Decades later, when her photographs were all that remained, Hester transformed these images, coloured by memory, into the haunting, austere paintings you see here. 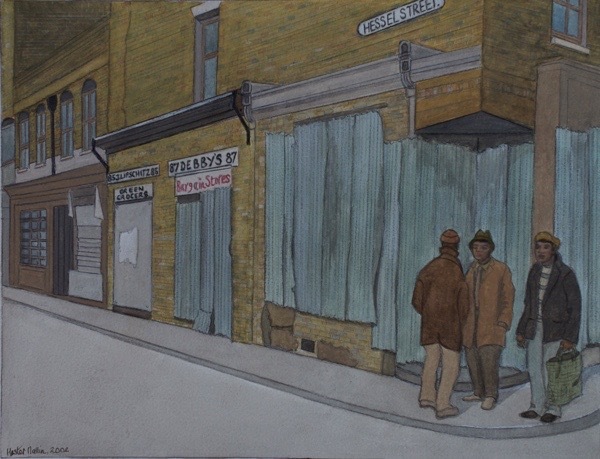 Of deceptive simplicity, these finely wrought watercolours of subtly-toned hues were emotionally charged images for Hester. 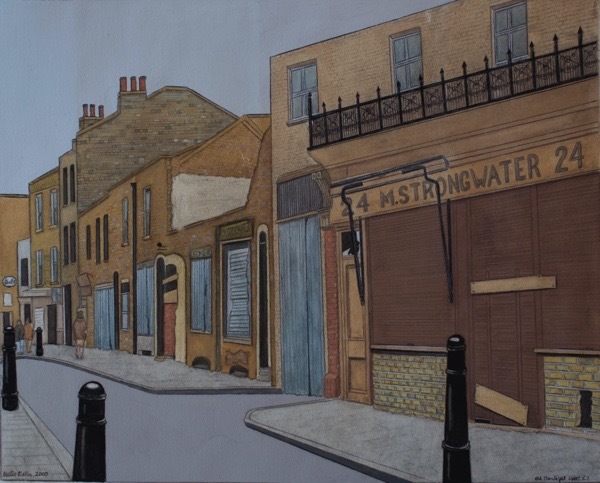 Even if the streets and buildings were gone and even if Hester could never go back to her childhood territory, she had these paintings. She cherished them as the only record of the place which contained her parents’ lives, their community and their world, which have now all gone completely. 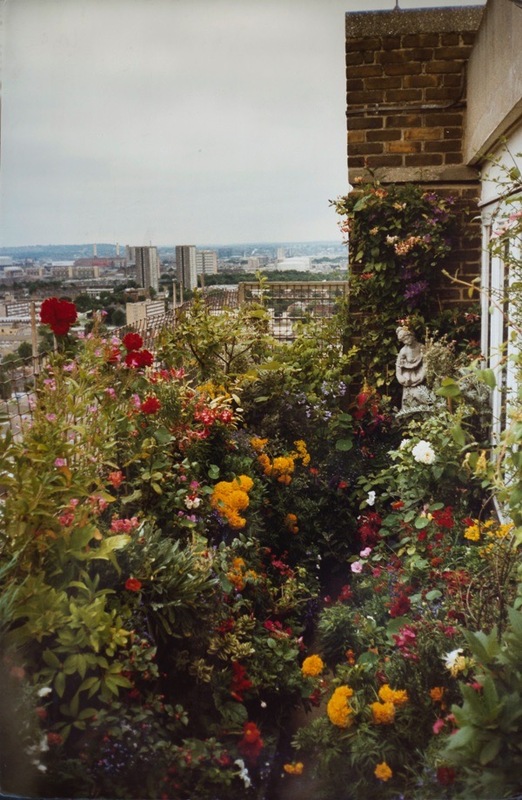 In later years, Hester discovered a talent as a gardener, celebrated for her flair at high-rise gardening, exemplified by her thirty-five foot balcony garden on the twenty-third floor in Bow, where the great and the good of the horticultural world came to pay homage to Hester’s achievements. Feature coverage and television appearances brought Hester international fame and demands for lectures, including a trip to the Falkland Isles to inspire the troops with horticultural aspirations. “I never got married and had children. In my experience, marriage for the working class girl was horrible. If she was unlucky, she met a man who she thought was nice, she would marry and he would change and become a wife beater. It was not for me. I saw so much of it. I thought ‘I’d rather stay single than get beaten up every time my husband gets drunk, Jewish or not.’ It never appealed to me. I never wanted to be married. Other people wanted to marry me but I never wanted to be married. My father, Maurice Smolensky, came in his early twenties from Lomza which is part of Poland now and I think my mother came from Russia too, but I am not quite sure. Her name was Rachel Salzburg – what was she doing with a German sounding name like that? It was very sad, she was sent on her own at fourteen years old. Can you imagine? A very beautiful young girl, illiterate, speaking no English and knowing nothing. There must have been a reason why they chucked her out to England. She was in terrible danger. She stood staring in bewilderment and grief. This was the time of the white slave trade when young girls were packed off to South America to be prostituted, yet she was luckyecause there was a gang of Jewish men looking out at the port in London. If they saw any young girl travelling alone, they would ask ‘Have you been sent?’ They would look after these girls and this is what happened to Rachel, my mother. They took her to the Jewish shelter in Aldgate and from there she spent a bewildering youth, working as a servant when she could get work. She was always pure. Poor girl. She was beautiful, with blonde teutonic looks. Apparently, her family came to the East End years later and she was in touch with them but only loosely. There must have been some big family goings-on, but I know not. They were bombed out of their house in Sutton St, off Commercial Rd, and disappeared, they did not take her. There must have been a falling-out. 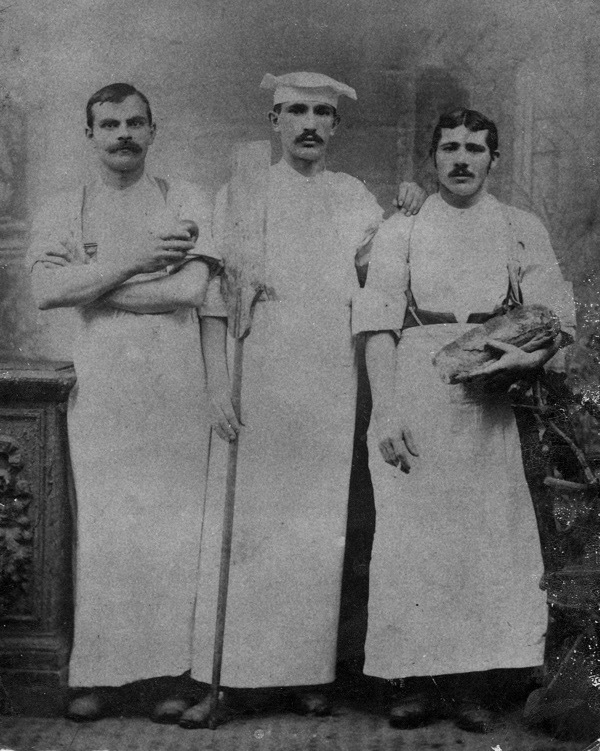 My father was a journeyman baker, who learnt his trade in Russia where, apparently, his father owned a mill. 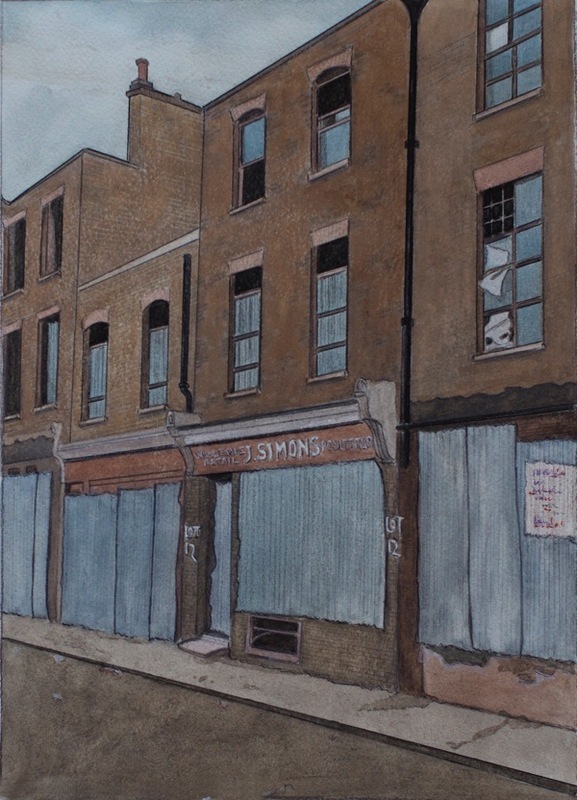 He worked in all the local bakeries around Hessel St, Christian St, Fairclough St – all those adjacent streets in Stepney where there were lots of little Jewish baker’s shops. He worked in the basements. My parents were put together by a Jewish matchmaker, that was how they met. At Raynes Foundation School, when I drew, my teacher used to say I was copying it from somewhere – but where would I copy it from? I remember we were all asked to draw a biblical scene. So I drew a picture of Moses leading his people out into the desert in chalk, with all these figures disappearing into the distance led by Moses with a long stick. I remember it clearly, the teacher stormed over to my desk and said, ‘Where did you get this from?’ Of course, I was flummoxed, I did not know what she was talking about so I could not answer. ‘No answer!’ she said, ‘You didn’t draw this.’ I was a shy child, I was absolutely silenced and defeated. That was my introduction to Art. I grew up in Langdale St Mansions, a block of two hundred flats of the slum variety and almost entirely occupied by Jewish people. It was horrible but my mother was exceptionally clean, she was fighting dirt all the time. I had a brother, Harry, he died a few years ago. He turned Left and became Communist, and that wrecked everything. He was lured into it by shameful people. My mother was a brave, brave woman. She went along to the Battle of Cable St to see what was going on. She was an amazing lady. When she came back, I asked ‘What was it like?’ but she would not answer me. It was obviously horrible. Even though she was illiterate, my mother knew what was happening in the world. Jewish people felt under threat. I left school at thirteen and a half just as the war began. Nobody bothered about me because they were doing their own thing. I found any old job – odds and ends of work in an office for six months. Then I started as an Air Raid Precautions messenger girl but that was not good enough for me – it was not dangerous enough – so I decided I wanted to be warden. I persisted and I became Britain’s youngest Air Raid Warden. I chose to do it because I wanted to do my bit and it was interesting because there was always action – Stepney was bombed and bombed and bombed. People got used to the sight of this little girl in warden’s uniform. I was not frightened, I was excited. Some of the elderly Jewish men who were too old for the armed services would come with me and we would stroll through the streets with bombs falling all around us. Our job was shutting doors. Street doors would pop open every time a bomb fell and we would put out a hand and shut it, and on the way back we would shut the same door again. There was a lot of looting going on. 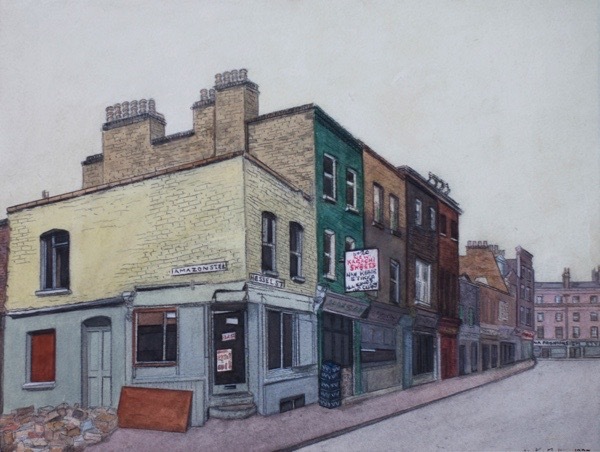 Towards the end of the war, I was moved into doing office work for Stepney Borough Council on the corner of Philpot St and Commercial Rd. It brought some money into the house and relieved my poor dad. He worked like a slave and died of overwork at seventy-one. He worked all night. I taught myself photography, I am a self-taught woman – an autodidact polymath. During the war, I realised the houses were all going, so I started to photograph them. 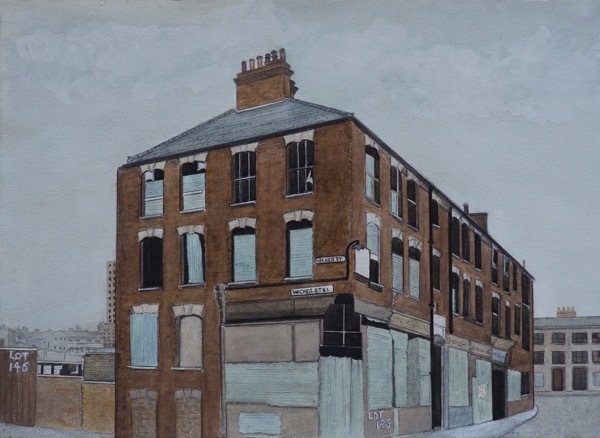 I thought, ‘Why aren’t more people doing this?’ I photographed architecture and out of my photographs came my paintings. The houses were being pulled down and I wanted to make a permanent record. 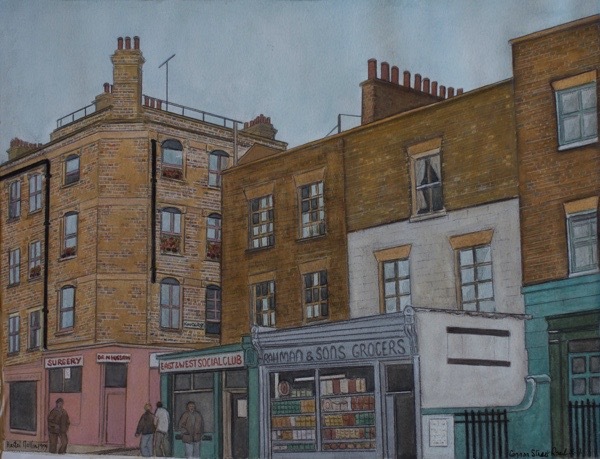 So I took a lot of photographs and later on I thought, ‘That would make a good subject for painting.’ It was one of those things, I just started painting because it attracted me. 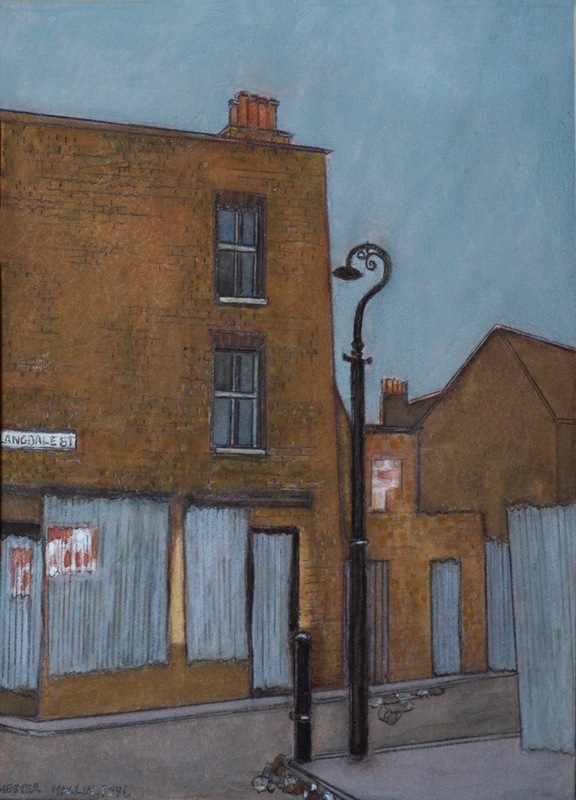 I never went out in the street and did paintings, some are from photographs and some are from memory. I never exhibited my work. I worked at the council until I was sixty when I retired because I wanted to concentrate on gardening and painting. I always wanted a garden when I was a child growing up in that slum flat on the fourth floor of hideous Langdale Mansions. I do not know how I knew, but I just knew I wanted plants. I never learnt about plants, it was instinctive for me. I used to buy seeds and little plantlets. In 1980, I moved into this tower block and there was an opportunity to create a thirty-five foot long balcony garden. I looked for plants that were low maintenance, wind resistant, needed little watering and did not grow too big. I had to teach myself and learn by experiment. I did many exhibitions of my gardening including one at Selfridges. I did the whole thing myself. I am always asked the same question, ‘Why do you speak so nicely?’ I do not know why I speak as I do. I listen to myself and I think ‘Where did you get that phrase from?’ I am self-educated, I have read a lot but anyone can do that. I am not a feminist, feminists have many faults and can be as vicious as anyone else. Bye Hester. You won’t be forgotten. Again, thank you yet another wonderful portrait of a talented, unique individual. I cannot help but feel that your site itself is a national treasure and needs to be saved for readers into the distant future. What a fascinating and extraordinary woman. Thank you for telling her story. A great story, very interesting to read that the way to improve the world is to improve oneself and leave the world to take care of itself. It says she painted from photos she took, what has happened to the photos? A very interesting and inspiring person. I would have loved to know more about the garden. Such wonderful, melancholy work. It’s sad that she’s gone. Thank you for telling us about this wonderful woman. I am sad to hear of the passing of Hester, she was a good friend and a regular visitor to my shop in the Roman. She was a smart and very determined woman, very intelligent and an interesting conversationalist. 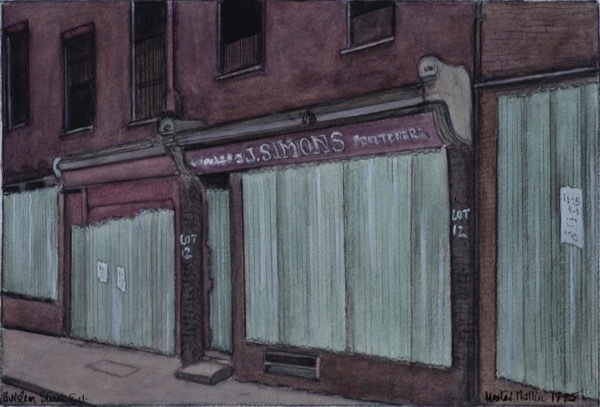 The loss of another East End legend. So glad to have seen these paintings GA, memories of a childhood filled with family walking, shopping, working in these streets. Fascinating story. Thank you for introducing us to this gifted insightful artist. the chronicler of her spirit and enthusiasms. What wonderful paintings and what awful teachers not to encourage her talent. Thank you for sharing her work. I’m so delighted t have found your postings, and am saddened to hear of Hester’s departure. I do hope she wasn’t alone…….that bothers me…..a treasure. 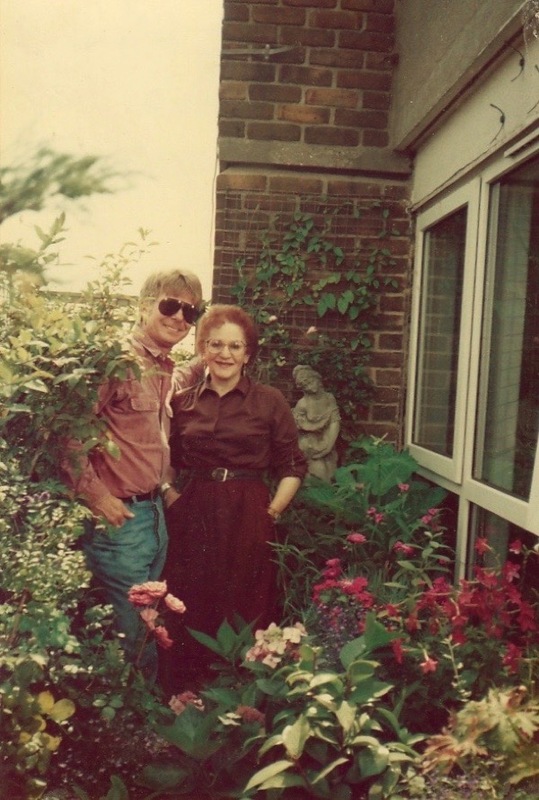 I worked for LBTH for 13 years from ’88 until 2001 and bizarrely my work took me into the homes of both Hester Mallin and Dorothy Rendell so it is curious but extremely sad to read of their deaths in such close proximity. They were both such captivating characters and my visits were always strung out for much longer than the task required simply to listen to them on any manner of subjects. Hester was aware of the structural implications of her garden in the sky and I still recall her mantra “a pint of water weighs a pound and a quarter” and so selected plants that required limited watering. She really was an interesting and knowledgeable woman. Just so glad you were able to tap into all of her experience and knowledge although when you left I can imagine you felt there was so much more to be garnered from her. My first encounter with Hester left me feeling rich because I had just met someone so unique, clever and interesting. I’m sad to hear she has passed and I trust she will be entertaining all those who have gone before her on her life and the experiences she has had. Thanks for adding the announcement about the passing of our Aunt Hester. We also appreciate the kind comments from those who knew her as well as strangers. Some have asked about the photos/paintings – Hester wished to keep all her papers (writings, articles etc.) + the drawings, paintings and photos)together and her wishes will be respected by the family (nephew and nieces). More information will be available at a later date. Hester was accompanied to the hospital by her faithful carer Humu who stayed with her for much of the time. She also had long visits from her nephew and niece (who came especially from the USA). She was much loved by us all even when the contact was by phone and this continued until it was impossible. Finally our thanks again to this website and the Gentle Author for bringing a part of Hester’s story to the public. May Hester Rest in Peace. in the information centre in Bethnal Green. A sad loss. I suddenly thought of Hester, with whom I worked at Tower Hamlets Council. She was really well thought of in the Public Relations section, and well respected as a local historian . She used to organise historical walks too. Such, a vital, talented and interesting lovely lady. How sad to have thought of her and find that she had recently died. Rest in peace, dear Hester! You were revered as a legend; the go to person for any local information.